by the American Horticultural Society! The Liberty Hyde Bailey Award is given to individuals who have made significant lifetime contributions to field of Horticulture. This award was named for horticulturalist, educator and author, Liberty Hyde Bailey and was first awarded in 1958. We are very proud to be led by a man who has helped to make our industry what it is today. Pierre and all of the 2018 Great American Gardeners National Award Winners are featured in the March/April 2018 issue of The American Gardener. Read the complete article below for more information on these awards and the wonderful work Pierre and his fellow award winners have done to achieve this great honor. Amy Hayes joins SBN Sales Team! New Hampshire and Southern Maine. Amy is very much looking forward to working with our Northern New England customer base and we are confident our valued customers will benefit from her extensive plant knowledge and field experience. either as a garnish or ingredient! View the article here. Congratulations to our own David Culp who for receiving the 2014 Perennial Plant Association Garden Media Award! This award recognizes individuals whose educational and promotional efforts have increased awareness of our industry and perennials in general. The award presentation took place on July 29th, 2014 at the 32nd Perennial Plant Symposium in Cincinnati, OH. David Culp and Brandywine Cottage featured in the Pittsburgh Post-Gazette! Check out the article at the post-gazette link below. As noted in the article, David will present a Summer Short Course tomorrow, July 11, at the Phipps Conservatory. 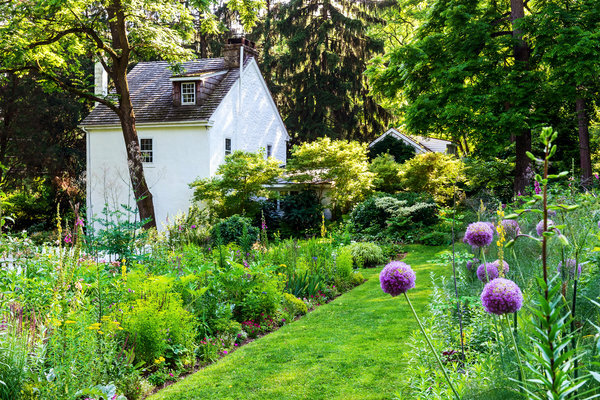 David Culp and his gardens at Brandywine Cottage featured in the Home and Gardens section of The New York Times today! Fine Gardening is publishing article in their June 2013 issue written by SBN's own Lori Davis. As an experienced horticuluralist, she writes about some uncommon plants: Actaea pachypoda ‘Misty Blue’, Aralia cordata ‘Sun King’, Syneilesis aconitifolia and Uvularia grandiflora. The April issue of Garden Design featured an article on Dave Culp and his book, The Layered Garden. In the photo pictured, Dave shows how one can think outside the pot with a little creativity. Press Release: UCONN Horticulrural Students Spend Earth Day Planting Green Roof Modules at Sunny Border Nurseries.